Supply chain visualization is about simple, intuitive and efficient distribution of analysis results to create awareness. Therefore, supply chain visualization is an important part of all our projects. Do you find it difficult to get an overview of your current supply chain performance in terms of deliveries, resource needs, costs and shortages? Is it even more challenging to understand the future balance between demand and supply? Supply chain visualization provides answers to these questions. It is natural for supply chain processes to cross several functions within the organization. Still, understanding the impact for all stakeholders is difficult, creating challenges when changes are necessary. Getting everyone to agree on the problem is the first step in solving it. Supply chain visualization will support you and all your stakeholders with an understanding of the current, and any possible future state of your supply chain. Supply chain visualization is part of all Optilon’s projects, which is why we have gathered a lot of experience in this area over the years. Apart from identifying purpose, content, and stakeholders, there are two main questions to solve: how can we easily customize visualizations without involving IT-expertise? How do we create an integration platform with complete access to the necessary data? Optilon’s solution for supply chain visualization makes data accessible, understandable and interesting for all. You can connect to data sources in a few clicks, then visualize and create interactive dashboards with a few more clicks. A requirement for us is that you, the user, can customize reports and dashboards without further help from consultants or your IT department. To speed up work and minimize risk, Optilon has developed a method for integration, OIL (Optilon Integration Layer). This technical platform can easily be integrated to multiple data-sources such as ERP-systems and data warehouses, using standard integration solutions for each underlying system. 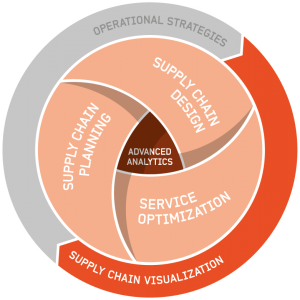 Do you want to know more about Supply Chain Visualization?